These highlights do not include all the information needed to use ANTICOAGULANT CITRATE DEXTROSE SOLUTION USP (ACD) SOLUTION A safely and effectively. See full prescribing information for ANTICOAGULANT CITRATE DEXTROSE SOLUTION USP (ACD) SOLUTION A. To report SUSPECTED ADVERSE REACTIONS, contact Terumo BCT, Inc. at 1-877-339-4228 or FDA at 1-800-FDA-1088 or www.fda.gov/medwatch. ANTICOAGULANT CITRATE DEXTROSE SOLUTION USP (ACD) SOLUTION A is added to tubing sets during apheresis procedures. The solution is connected to the tubing set in an apheresis collection. 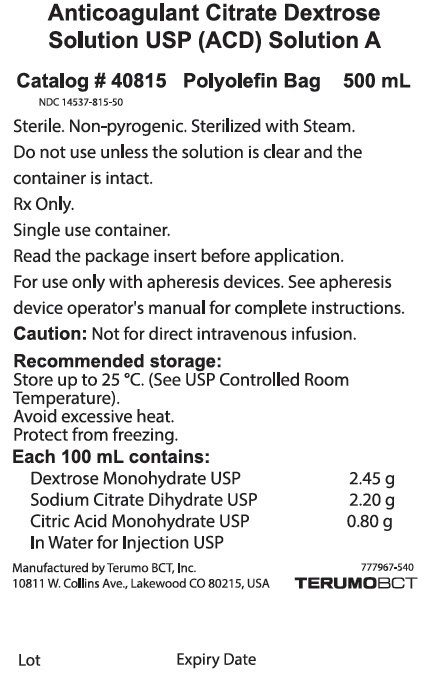 The recommended dose is determined by the apheresis device and metered into the tubing set by the apheresis device. It is not intended for direct intravenous infusion. 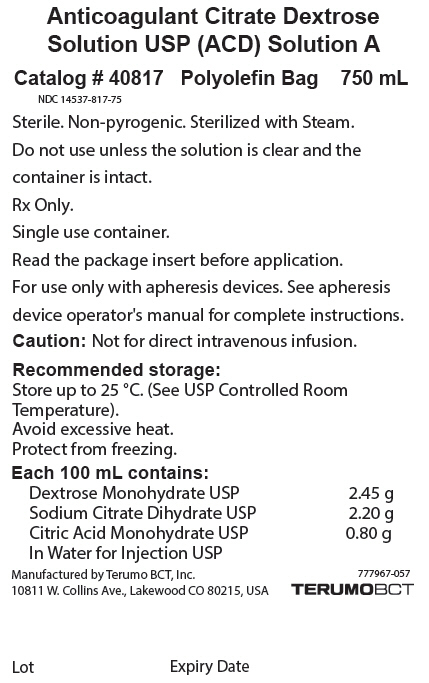 For instructions on the use of the solution with the apheresis device and tubing set, see the device operator's manual. Ensure solution is the ANTICOAGULANT CITRATE DEXTROSE SOLUTION USP (ACD) SOLUTION A and is within the expiration date. Inspect the bag. Do not use if the container is damaged, leaking or if there is any visible sign of deterioration. Use only if solution is clear and free of particulate matter. Directions for Connecting the ANTICOAGULANT CITRATE DEXTROSE SOLUTION USP (ACD) SOLUTION A bag to the apheresis device. Remove the overwrap by pulling down at notch, and remove the ANTICOAGULANT CITRATE DEXTROSE SOLUTION USP (ACD) SOLUTION A bag. Check for leaks by gently squeezing the bag. If leaks are found, discard the bag. Ensure that the solution is the ANTICOAGULANT CITRATE DEXTROSE SOLUTION USP (ACD) SOLUTION A and is within the expiration date. Inspect the solution in adequate light. Bags showing cloudiness, haze, or particulate matter should not be used. Remove the protective cap from the port on the bag. Connect the bag to the apheresis device tubing set using aseptic technique and hang the solution. Break the frangible connector. When you break frangible connectors, bend them in both directions to ensure that you break them completely. Failure to do so may result in restricted flow. Proceed according to the apheresis device operator's manual. 500 mL or 750 mL ANTICOAGULANT CITRATE DEXTROSE SOLUTION USP (ACD) SOLUTION A is a sterile solution in a polyolefin bag. Each 100 mL contains: (%w/v) Citric Acid, Monohydrate 0.8 g; Dextrose Monohydrate 2.45 g; Sodium Citrate Dihydrate 2.2 g; and Water for Injection. DO NOT INFUSE ANTICOAGULANT CITRATE DEXTROSE SOLUTION USP (ACD) SOLUTION A DIRECTLY TO THE PATIENTS. Verify that the ANTICOAGULANT CITRATE DEXTROSE SOLUTION USP (ACD) SOLUTION A has been securely attached to the Anticoagulant (AC) line on the system tubing set. Use aseptic technique throughout all procedures to ensure donor safety and quality. Do not reuse. Discard unused or partially used solution bags. Citrate reactions or toxicity may occur with the infusion and return of blood containing citrate anticoagulant. The recipient of the blood containing citrate should be monitored for the signs and symptoms of citrate toxicity. The signs and symptoms of citrate toxicity begin with paresthesia, a "tingling" sensation around the mouth or in the extremities, followed by severe reactions that are characterized by hypotension and possible cardiac arrhythmia. Citrate toxicity may occur more frequently in patients who are hypothermic, have impaired liver or renal function, or have low calcium levels because of an underlying disease. ANTICOAGULANT CITRATE DEXTROSE SOLUTION USP (ACD) SOLUTION A has not been adequately studied in controlled clinical trials with specific populations. ANTICOAGULANT CITRATE DEXTROSE SOLUTION USP (ACD) SOLUTION A is designed to be metered by an apheresis device in apheresis procedures, to prevent platelet activation and coagulation as blood moves throughout the extracorporeal unit (tubing set) in an apheresis procedure. The solution is sterile and non-pyrogenic, and it contains no bacteriostatic or antimicrobial agents. The formulas of the active ingredients are provided in Table 1. Each 100 mL of ANTICOAGULANT CITRATE DEXTROSE SOLUTION USP (ACD) SOLUTION A contains: (%w/v) Citric Acid, Monohydrate 0.8 g; Dextrose Monohydrate 2.45 g; Sodium Citrate Dihydrate 2.2 g; and Water for Injection. The polyolefin bag is not made with natural rubber latex or PVC. The bag is made from a multilayered film. It contains materials that have been tested to demonstrate the suitability of the container for storing pharmaceutical solutions. The solution contact layer is an elasticized polyolefin. The bag is nontoxic and biologically inert. The bag-solution unit is a closed system and is not dependent upon entry of external air during administration. The bag is overwrapped to provide protection from the physical environment and to provide an additional moisture barrier when necessary. This solution has no pharmacological effect. ANTICOAGULANT CITRATE DEXTROSE SOLUTION USP (ACD) SOLUTION A is a clear solution supplied in sterile and non-pyrogenic polyolefin bags. The 750 mL bags are packaged 12 bags per case. The 500 mL bags are packaged 18 bags per case. Store up to 25 °C [See USP Controlled Room Temperature]. Sterile. Non-pyrogenic. Sterilized with Steam. Read the package insert before application. device operator's manual for complete instructions.